March 2018: RespondBC! is now an annual series of artworks recognizing diverse voices of our community. February 2018: The John Hope Franklin Memorial Day Freedom Concert featured the Brooklyn College Symphonic Choir, Conservatory Singers, and the Glee Club. February 2018: The John Hope Franklin Memorial Day celebration opened with a discussion on African American history and the public sphere. October 2017: Rabbi Michael Lerner spoke of his strategies for combating racism and anti-Semitism, and the psychopathology that creates this climate in US politics. April 2017: A panel discussed the struggle for immigrant rights, resistance, how to join the cause, and why it's so important. April 2017: Students questioned panelists Danny Greenberg '66, Judge Sharon Bourne-Clarke '89, Wendy Amengual Wark, and Norman Siegel '65 on today's civil rights movement. March 2017: How can we participate in today's civil rights movement? Judge Sharon Bourne-Clarke '89 answered that question. March 2017: Professor Louis Fishman, Hussein Ibish, and David Meyers in a lively back-and-forth on Zionism and Palestinian Nationalism. March 2017: Cornell University's Maria Cristina Garcia and Professor Anna Law assess the historical and constitutional context of President Trump's immigration executive orders. March 2017: In conjunction with the SEEK program, Pardeep Kaleka and Arno Michaelis of Serve 2 Unite shared their transformative experiences. February 2017: Filmmaker and director Sam Pollard (Slavery By Another Name) in conversation with Film Studies professor Paula Massood. February 2017: A series of films, lectures, and artwork celebrating the life and work of John Hope Franklin. February 2017: Professor Moustafa Bayoumi addresses issues surrounding surveillance and the First Amendment, in light of undercover operations on campuses. February 2017: Immigration lawyer Arda Beskardes answered student questions on President’s Trump’s controversial Travel Ban. President Michelle Anderson's "We Stand Against Hate" series has been a campus fixture since spring 2017. Throughout the year, the initiative often features lectures, workshops, concerts, programs, and events that reflect our ongoing commitment to elevating dialogue, enhancing understanding and compassion, and celebrating the voices that make up our diverse campus community. What happens to American society when the practice of torture is no longer reviled but instead put up for debate? A conversation between CUNY School of Law’s Professor Ramzi Kassem and Brooklyn College Professor Moustafa Bayoumi as they discuss the legal, political, and cultural implications of torture today. An interfaith dialogue featuring Turkish writer and The New York Times International journalist Mustafa Akyol, author of Islam Without Extremes: A Muslim Case for Liberty. OneVoice presented a workshop on conflict resolution, using a five-step model designed to depolarize conflict across communities, and foster viewpoint diversity and constructive disagreement, and using the Israeli-Palestinian conflict as a case study. Reflections on the major monotheistic religions in dialog with one another, with Professors David Brodsky (Judaic Studies), Bilal Ibrahim (History), Lauren Mancia (History), and Sara Reguer (chair, Program for Studies in Religion). RespondBC! recognizes the diverse voices of the Brooklyn College community by showcasing their art, in any media, that conveys their personal, social, cultural, or political positions. What is the history of Jewish-Christian-Muslim relations? History and Judaic Studies faculty engaged in discussion about what we can learn from the pre-modern history of these religions. An informative panel discussion on the legal rights of immigrants, and the resources available to them at CUNY. The John Hope Franklin Memorial Day celebration opened with a discussion on African American history and the public sphere, featuring panelists David Blight, public historian (Frederick Douglass: Prophet of Freedom), the National Museum of African American History and Culture’s John W. Franklin (My Life and an Era: the Autobiography of Buck Colbert Franklin), and Kimberley Phillips-Boehm, award-winning historian and writer (War! What is it Good For? Black Freedom Struggles and the U.S. Military from World War II to Iraq). The evening’s Freedom Concert featured the Brooklyn College Symphonic Choir, Conservatory Singers, and Glee Club. An enriching conversation about diverse immigrant experiences and their ethical implications in the current political context. Professor Daniel Campos will be in conversation with philosophy student Nimra Asif. Professor Alex Vitale, author of The End of Policing, debated the future of law enforcement with Heather McDonald, author of The War on Cops. Watched (Katie Mitchell, 2017), is an intimate and moving exploration of the experience of coming of age - under the gaze of state surveillance. The screening was followed by a discussion with guest speakers, Prof. Jeanne Theoharis and filmmaker, Katie Mitchell. Rabbi Michael Lerner discusses the psychopathology in American life that creates the climate in which racism against African Americans and anti-Semitism grow, and strategies to take the country in a different direction. Jasinta De La Cruz is an immigration lawyer with CUNY’s Citizenship Now! Project, which provides free, confidential immigration legal services to help students, their families, and other immigrants in the city on the path to U.S. citizenship. Andrew Horton's documentary, aughter Without Borders, followed four Swedish clowns in Northern Greece in 2016 as they bring laughter to Syrian refugee children. The screening was followed by a Q&A with the filmmaker and some Swedish clowns. The election of Donald Trump inspired thousands of residents across the country, many of them new to activism, to join in active protests. Music and sound are an important means to engage these protesters, build solidarity among them, and keep them going. This was a preliminary account of the sounds of these protests, outlining the paths of historic reference, innovation, and global circulation. People have used art to respond to shifts in culture, politics, and society for generations. RespondBC! was no different, gathering a series of artworks across all mediums in a response to the current pressures of society and growing political tension in the United States. How does one resist the Trump administration's xenophobic policies? Why is it important to engage in this struggle today? In a panel discussion, journalist Sami Disu, Make the Road’s Luiza Tanuri, and Bay Ridge for Social Justice’s Yasmine Kamel, shared how and why everyday people can join the cause. A beautiful, lyrical novel retelling the story of Romeo and Juliet but through the lens of modern-day lovers during the current Israeli-Palestinian conflict, read by author Pamela Laskin. 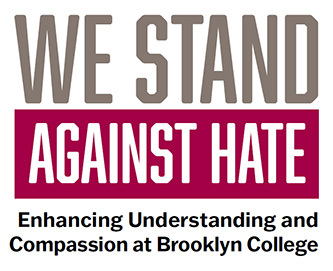 Organized by Brooklyn College’s SEEK program, Pardeep Kaleka and Arno Michaelis, Serve 2 Unite co-founders, elaborated on how their experience of hate and violence was transformed into understanding, acceptance, and compassion. How can we participate in today’s civil rights movement? We asked: Danny Greenberg '66 (Legal Aid Society New York), Judge Sharon Bourne-Clarke '89, Wendy Amengual Wark, and Norman Siegel '65 (NY ACLU) replied. In a lively back-and-forth hosted in the Woody Tanger Auditorium, Hussein Ibish (Senior Resident Scholar, Arab Gulf States Institute) and David Meyers (Judaic Studies, UCLA) provided a thoughtful look at the history and interpretation of two opposing movements: Zionism and Palestinian Nationalism. We Stand Against Hate Series Presents "Shared Paths, Divergent Courses: Zionism & Palestinian Nationalism"
Tasked with the difficult job of assessing the historical context of President Trump’s immigration-based executive orders, Cornell University’s Maria Cristina Garcia and the Center of Constitutional Rights’ Shane Kadidal, in two events, provided insight into how Trump’s actions will affect immigrants, refugees, and exiles in the United States. A celebration of Coretta Scott King’s vital role in the civil rights movement through choral music, poetry, and prose, led by professors Malcolm J. Merriweather and Ira Spaulding. A fun, informative game show, hosted by professors Beth Evans, MJ Robinson, and Katherine Fry, that served to teach students how to identify and deal with the problem of fake news in modern journalism. Culminating in mini-performances based on collected stories, Otherness & Togetherness: A Storytelling Workshop brought together storytelling, conversion, and improvisation skills in a series of helpful workshops. Disturbing the Peace highlights former Israeli and Palestinian combatants who transform into nonviolent peace activists, culminating in forming Combatants for Peace. The screening was followed by a Q&A session with the filmmakers and participating members of Combatants for Peace. A collection of films, lectures, political dialogues, and an exhibition of African-American art and history, that celebrated the life and work of John Hope Franklin, the first African-American chair of an academic department. In this conversation, professors Moustafa Bayoumi (English), Benjamin Carp (History), Sandra Kingan (Mathematics), and Alex Vitale (Sociology) tackled the problem of state-sponsored, undercover operations on university campuses in the context of the First Amendment. In this panel, Professors Penny Repetti (Philosophy) and Katie Rose Hejtmanek (Anthropology) explored the meaning of human culture and how to accept and understand the variety differences among them. A Q&A on President’s Trump’s Travel Ban, an executive order banning immigrants from seven Muslim-majority countries, that featured immigration lawyer Arda Beskardes, and hosted by the Office of International Student and Scholar Services. First of a series of monthly dialogs on high-quality children's books, occasionally with the author, designed to develop empathy in readers of all. Hosted by Dean April Bedford, the Children's Books on Compassion Series promoted the best of children’s literature and their authors.